When did the round house fall out of vernacular use throughout Britain and Ireland? When did roundhouses fall out of vernacular use? They fell out of use in South-West Britain in the 8th Century. Wales may have had them potentially for longer. 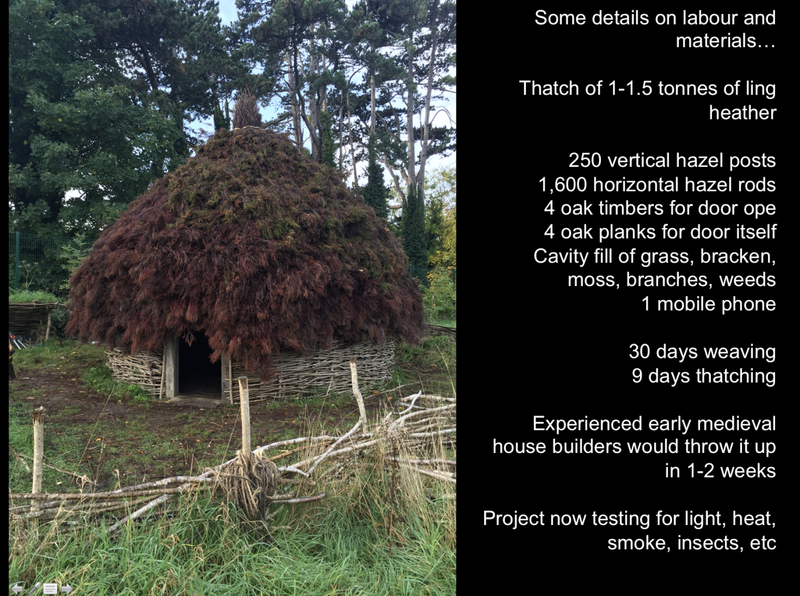 Rectangular houses become popular among Irish elite 900 - 1000 CE. What about lower classes in Ireland? How much longer did they last in Wales? What about Northern Britain and Scotland? Roundhouses are a staple feature of Antique and Late Antique Britain and Ireland in the imaginations of most people, their association with the Brythonic and Goidelic speaking peoples of the isles can't be uncoupled. But the later medieval world is dominated by rectangular housing across Europe, I'm interested in the chronology of this change in Britain and Ireland. Of course, if this is the case, can the same time frame be applied to the non-elite of Ireland? Surely a taste for rectangular buildings must have taken some time to 'trickle-down', especially in remote regions and groups that may not have the resources to rebuild their dwellings? Characteristically circular buildings  as opposed to rectangular, often in stone as well as timber, along with sculptured Celtic crosses, holy wells and the reoccupation of Iron Age and Roman sites from hillforts such as Cadbury Castle, promontory hillforts such as Tintagel, and enclosed settlements called Rounds  characterise the western Sub-Roman Period up to the 8th century in southwest England and continue much later in independent Wales at post-Roman cities such as Caerleon and Carmarthen. But this has really been the limit I've come to in my research, very broadly roundhouses fell out of use in south-west Britain as late as the 8th century, and Wales perhaps later, rectangular houses became the norm for elite Irish 900 - 1000. This, of course, leaves gaps, when did they fall out of use in Wales? How long did it take for rectangular buildings to become popular through all classes of medieval Ireland? What about Northern Britain? What about Scotland, where the population didn't experience the same continental influences/incursions in the same way or time? "Flying Past - The Historic Environment of Cornwall: Enclosed Settlements". www.historic-cornwall.org.uk. Retrieved 1 April 2018. Browse other questions tagged britain architecture early-medieval ireland celts or ask your own question. Where did the Gaels originate? What made William Pitt beleive that it was in England's “interest of England to govern Ireland” when Ireland and England were unified? How common was banditry in 16th & 17th century Great Britain and Ireland? Did the biblical apostle James visit Ireland? Did the Romans ever deploy troops to, or try to conquer, Ireland? When did the Saxons settle Britain? Why are Vikings singled out for raids in Britain and Ireland when records may indicate most raids were by local rulers?